After having already had 3 children and a houseful of dogs and cats I pretty much thought I was prepared for our 4th baby girl, Kelsyann. I'm an experienced Mom right?!? This should be easy. Well.....boy was I wrong. From the beginning Kelsyann has been a needy baby. Nothing that worked with the others seemed to work for her. This has been interesting, frustrating and challenging at best! My husband and I have had to adapt compromise and modify all that had worked previously....including now we have a 7 month old that sleeps with us. That was something I had once sworn I would never do but....guess what it works for us and we all get sleep. So, for today that is our decision. I am posting this as there are many good lessons here as we all parent our kids and well, our dogs too. I choose the term "parent" in this circumstance as I am thinking of my crew of 4 dogs. Each is different and needs a different set of boundaries and approaches to help them be successful....hmmm a lot like my kids. The similarities in parenting my kids and including our dogs in our daily lives really do mirror one another. This makes me think and ponder many things. How do I want my kids and dogs to perceive me? How do I build a trusting relationship with them so that both my 13 yr old son and my 5 year old rescued pit bull can comfortably seek me out in times of stress? How do I allow them the freedom to learn and trust by experiencing new and different things while learning coping skills? There is so much information about both raising kids and training dogs that often it can be overwhelming and frustrating. Many parents and myself included can easily feel incapable if they do not do things a certain way. This puts a great deal of pressure on everyone. Is that really necessary and fair? As we share our lives with dogs and children we must remember to appreciate their own uniqueness and needs and not fall into labeling and grouping that may not truly support their success. This can be hard with so many opinions out there related to how to train your dog or raise your child. It is easy to seek help and then feel overwhelmed by it all. So, as I feel frustrated with my 7 month old daughter who feels her crib is a torture chamber.... and naps are for other babies I am once again reminded that just because something worked for 3 of our children does not mean it will work for all and I must adapt how I respond to what feels right and works in our home. Let go of the pressures to do it one way or another based on something I read or heard. Rather, follow what works for us in our home. This is true with our dogs as well. Many people want to believe there is only one method of doing things in dog training but I suggest that it is based on each individual dog and circumstances that will best set them up for success. So, do your research and then take the parts that work for you and ditch the rest. Trust your gut and know that learning as you go is part of the process. Most of all enjoy the unique and different experiences that challenge you to grow! 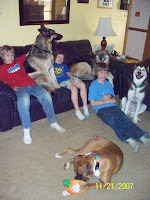 Dog body language through Doggone Safe! Whats a dog gotta do!